Twenty years ago, Jason Wilber and I began to work on songs for James Still’s Amber Waves. My wife, Jan Lucas, and I were to play the farm couple, Mike and Penny. In most ways neither of those tasks were a stretch. I spent many summers on my grandfather’s farm in northern Indiana, working with both him and my youngest uncle, Jim. He was the one brother Grimm who “stayed with the farm” while three others became lawyers and my father chose to become a schoolteacher. I learned about the weather and how farmers have an almost symbiotic relationship with its vagaries and blessings. I learned about hard physical work: the heat, the sweat, the fatigue. I learned a different lesson about the importance of family: that attitude and willingness to pitch in for friends and neighbors at the drop of a hat and the blowing in of a storm. Jan and I together experienced the best parts of this rural farm life when we moved back “home” from the West Coast when our boys were young. We looked to the wisdom of the surrounding older farm couples, and my romantic vision of the small family farm blossomed. 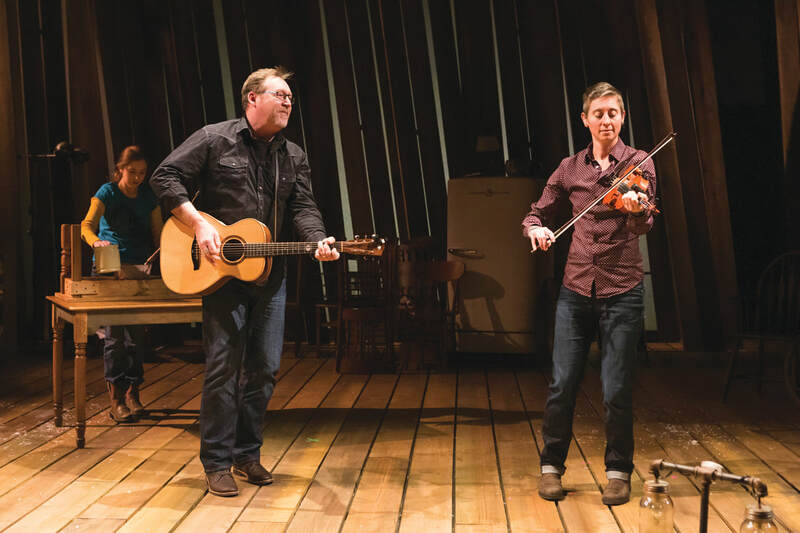 James made our job easy, these songs we wrote, because the play itself is rich with elemental stories of the rural human condition and its relationship with the land—framed in the elegance of the four seasons and the tapestry of multiple generations. “Amber Waves,” the title song, was the first song I wrote for the play. I wanted a song that could almost serve as an anthem, that distilled and spun the essence of James’s script. I wanted the song to be filled with hope and reverence and hardship, because that is the landscape of the play. I wanted to be able to come back to the melody during the evening, to find both its minor version and its more exuberant state. Twenty years later we find ourselves now.... I have asked multi-instrumentalist Rachel Eddy to join me in creating the sonic landscape of Amber Waves. Rachel is a master of the fiddle and the banjo and likely will pick up another instrument or two in the evening. She comes from the old-time music tradition of Appalachia. It’s a tradition based on community—where everyone plays together, learning tunes that are passed down, and the notion of “performance” is almost frowned upon. On one hand, it seems very simple; on the other it is richly complex. I know I’ll learn some things from Rachel. I came up in folk music, steeped in the history of the troubadour: the writer of songs about “folks,” songs about the human condition and pretty much anything we love and are willing to fight for in this world. Together, Rachel and I will create the musical landscape of the farm, its inhabitants, and the seasons that they move through. When I listen back to the songs that Jason and I wrote 20 years ago, it’s like sitting down with an old friend: you know them, and you trust they’ll be true. As I write this, I’m thinking there may be a new song or two in the mix. We’ll see as we dive into the creative process. In these past 20 years, I’ve found myself forever straddling the line between theatre and music, and I love these opportunities of blending and bending the two together. At the core, what I do is about storytelling. It always has been. Jordan Pecar, Tim Grimm and Rachel Eddy in IRT's 2019 production of Amber Waves. Photo by Zach Rosing. A long time ago I ran away from home. In many ways, Amber Waves has been one of the ways I’ve never forgotten where I come from. The writer Willa Cather wrote many of her novels that were set in the Midwest while she was living in New York. Mark Twain wrote his novels set on the Mississippi while living in Connecticut. I first wrote Amber Waves while living in New York in a fifth-floor walk-up apartment in Hell’s Kitchen in the same room where my roommate was watching TV, listening to the radio, and talking on the phone. Somehow with the help of my Walkman—remember the Walkman?—I kept my headphones on and my head down. I would type with my eyes closed because the unrelenting and beautiful landscape of the Midwest was profoundly alive inside me. The play was set in my native Kansas; when the IRT produced it in 2000, I wrote a version set in Indiana. For this current IRT production, I’ve reimagined the play again—this time from my home in Los Angeles. I affectionately call it Amber Waves 3.0. Much has happened in the world since I first wrote the play, but one thing that hasn’t changed is that family farms continue to disappear, and with them a way of life disappears as well. Two events I want to share with you. The first is the loss of my own family’s farm. My grandparents, in their mid-eighties, had finally decided to sell the family farm in Kansas and move into the nearest town. The auction was like all the auctions that happen on summer weekends throughout the Midwest. Strangers, old friends, and family members sift through a lifetime of mementos. The highest bidder takes home things that I grew up with: a stereoscope, my grandmother’s wedding dress, an old Case tractor...the house. My great-grandparents homesteaded that house. My grandparents moved into that house on their wedding day and lived there for more than 60 years. My father was born in that house. I grew up going to that house, to that farm, playing in the fields of 80 acres in Eastern Kansas. Flash forward to just a couple years ago: I was visiting my dad in Kansas and we decided to make the 90-minute drive just to see what had happened to the old farm. I wondered who might live there now, if they had found my handprints in the cement sidewalk leading up to the house. Was there still the comforting smell of my grandma’s cherry pies baking in the oven? When we approached the old place, something was different, disorienting. My dad and I fell silent. The entire place had been razed. The barn and chicken coop and garage—everything was gone. And the house was gone. The only thing I recognized was the remains of the old circle driveway and the water hydrant that was still in the front yard. We didn’t get out of the car. People driving by would have no idea that this was once the place where a family thrived. They would have no idea that once there was a little boy who spent long summer days playing in the hayloft or watching my grandma make her prize-winning quilts or riding my grandpa’s horse. People would have no idea that this little boy grew up to be a writer and wrote a play called Amber Waves which at its heart is meant to honor generations of farmers, a way of life that continues to disappear, and how the relationship to land is both holy and practical. 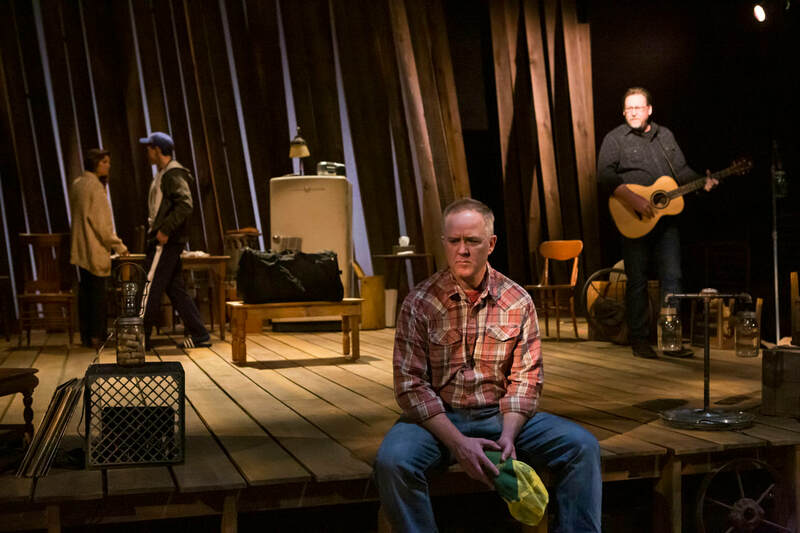 I’ve come to understand that writing this play has been one way of returning—spiritually and emotionally—to a place where sunsets seemed to last longer, where generations of a family were carved into the land like rings of a tree, and where ordinary hard-working people spoke a kind of poetry that is all their own. It is a poetry everyone understands. It’s the poetry of place and family, it’s the poetry that helps us remember what home means. Amber Waves is part of me, it goes with me wherever I go. I hope it might become part of you as well. Mary Bacon, William Brosnahan, Torsten Hillhouse and Tim Grimm in IRT's 2019 production of Amber Waves. Photo by Zach Rosing. The IRT produces top-quality, professional theatre that engages, surprises, challenges and entertains people throughout their lifetimes, helping to build a vital and vibrant community. ​If you are interested in reviewing a production and would like to receive media passes please email us.